Time for a wellness checkup. Water wells have been in existence since the time of the Phoenicians around 1500 B.C. And today they are still very popular with an estimated 13 million households utilizing private wells for drinking water in the United States. This number does not take into account the various industries and businesses that also rely on private wells. Dug/Bored wells are dug by shovel or backhoe and are approximately 10-30 feet deep. They are cased to prevent collapse but are not cased continuously. Well casing is the tube-shaped structure placed in wells to maintain openings and prevent contaminants from entering and mixing with the drinking water. Driven wells are built by driving pipe into the ground, cased continuously and approximately 30-50 feet deep. 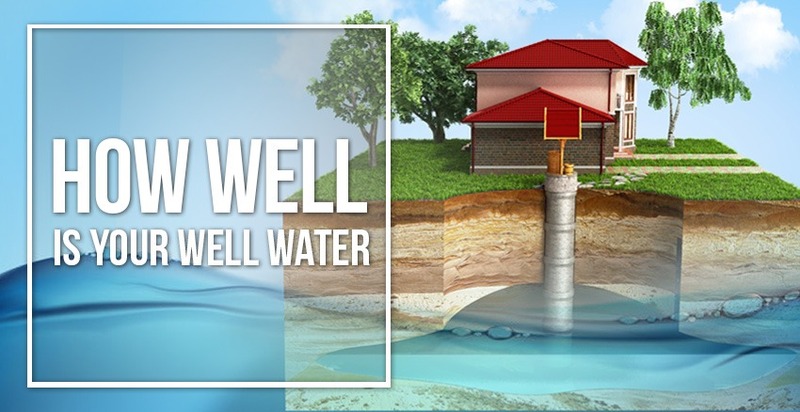 Though these wells are continuously cased, they can be contaminated easily because they draw water from aquifers – underground layers that hold water within soil and porous rock. Drilled wells are constructed using percussion or rotary-drilling machines. These wells can be thousands of feet deep and have a lower risk of contamination due to their depth and implementation of continuous casing. Regardless of the type, there are common concerns among all wells. For example, everyone enjoys the wonderful smell of sulfur that permeates the air on a Summer’s day – as water flows from the tap – not! Well water also has a nasty heavy metal buildup, such as iron, that stains clothes with a reddish-brown tint. Yes, it can be nasty! While these can be the annoying problems with well water, there are still more serious concerns. There are no government regulations when it comes to private wells. The home or business owner must shoulder this responsibility. Well water testing for various types of contamination is the only way to know what’s going on with the water in your well. So, what could possibly be making your well water unwell? Microorganisms, including bacteria, viruses and parasites are all over the Earth’s surface and enter wells through rainwater runoff or melting snow. Plus, leakage of waste from underground storage tanks may cause this contamination. Nitrates and nitrites, which you cannot see, smell or taste, are present in chemical fertilizers, human sewage and animal waste and fertilizers – contaminating wells through groundwater movement and surface water seepage. Fluoride is something we don’t think about in wells, yet it can be found in many aquifers, and therefore it can be found in abundance in some private wells. Heavy metals can leach into wells from multiple sources such as household plumbing and service lines, mining operations, petroleum refineries, cement plants and natural mine deposits. Arsenic is an element found in nature which is at the top of the well water danger list. It lurks in the bedrock of various regions of the United States, contaminating the surrounding soil and potentially infecting well water. Radon is another naturally occurring radioactive gas lingering in the soil -produced through the normal decay of uranium and radium. It has no color, odor, or taste and can only be detected by testing. It can seep in. Time to test and treat. Test your well water 1-2 times per year for bacteria and gases. Test your water any time your water system is open for repairs. Test your system should there be flooding or obvious runoff. Did you know Gordon Brothers offers a DIY (do-it-yourself) bacteria test? It’s an easy 3-step vial process that’s accurate. Use it at your convenience in the comfort of home. You can stop by our office to pick up yours today. We do recommend additional testing if there are any signs of concern. If necessary, there are multiple treatments available for microbes and gases found in well water. Chemical treatments using chlorine, bromine or ozone are cost effective at removing most, but not all microbes. Mechanical treatments use UV light, ultra-filtration and distillation, which are more effective in removing 99.99% of harmful microorganisms, but they are more costly. Either way, chances are good with the right type of treatment these contaminants will not get through your tap. Gordon Brothers offers free in-home testing, in addition to our DIY test to get you started. The only way to know for sure what’s in your water is to start with a test. Gordon Brothers can then help customize solutions for you from drinking water systems to whole house systems. We help you get the best water on tap. Call Gordon Brothers today at 800-331-7611 or visit gordonbroswater.com. Wouldn’t it be great to enjoy a refreshingly pure glass of water right from your tap?